This is a sticky post. New posts are provided below it. 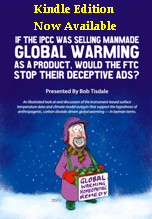 If the IPCC was Selling Manmade Global Warming as a Product, Would the FTC Stop their Deceptive Ads? is now available for color versions of Kindle readers ($7.99US), and in its original .pdf edition ($10.00US). If the IPCC was Selling Manmade Global Warming as a Product, Would the FTC Stop their Deceptive Ads? has been published for color versions of Kindle due to its popularity in .pdf form. The failings of the computer-based climate models used by the Intergovernmental Panel on Climate Change (IPCC) are exposed in If the IPCC was Selling Manmade Global Warming as a Product, Would the FTC Stop their Deceptive Ads? The discussions are intended for readers without technical or scientific backgrounds, and they are presented with more than 200 color illustrations, which allow the 20th Century surface temperature data and the publically available data from the IPCC’s climate models to tell their stories. Based on computer simulations of 20th Century global surface temperatures with and without anthropogenic greenhouse gases, the IPCC says the warming was most likely caused by increased concentrations of manmade greenhouse gases. But those climate models show no skill at being able to simulate the warming of global surface temperatures over the 20th Century. This is plainly visible in time-series graphs when the model outputs are compared to surface temperatures during the two warming periods and the two periods when surface temperatures leveled out or cooled slightly. If the IPCC was Selling Manmade Global Warming as a Product, Would the FTC Stop their Deceptive Ads? also allows satellite-based sea surface temperature data to show how, where and why it has warmed over that past 30 years. It includes a detailed, introductory-level explanation of the natural climate phenomenon known as the El Niño-Southern Oscillation (ENSO) and describes how ENSO is misunderstood or misrepresented by some climate scientists. And it explains where, online, readers can find the surface temperature and climate model data, in easy-to-use formats, and how to reproduce the graphs in the book so the readers can confirm the results. I’d never read a book with links on my PC version of Kindle, so I wasn’t sure if they would work. When I first uploaded If the IPCC was Selling Manmade Global Warming as a Product, Would the FTC Stop their Deceptive Ads? 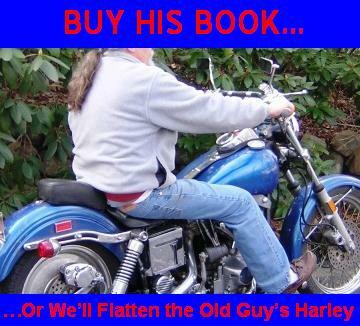 to Kindle Direct Publishing, I was happy to discover they did. And the colors for the 220 illustrations came through loud and clear. If the IPCC was Selling Manmade Global Warming as a Product, Would the FTC Stop their Deceptive Ads?includes my most detailed, to date, description and documentation of the processes of the El Niño-Southern Oscillation (ENSO). In fact, almost 25% of the text and 55 of the illustrations in the book are devoted to ENSO. I’m glad I contacted Josh of CartoonsbyJosh for the cover art. This entry was posted in El Nino-La Nina Processes, Essays & Books, Model-Data Comparison LSAT, Model-Data Comparison SST, Model-Data LOST, Natural Warming. Bookmark the permalink. Gidday Bob – I have just run comparisons on the official versions land only CRUTem2 – 3 & 4 – global and NH – SH. Fascinating to see where the extra warm trend comes from for CRUTem4. – now that Dr Phil is back in charge. Thanks for the link, Warwick. Pingback: Results from the surface temperature outlier races, just in time for AR5 | Watts Up With That? Pingback: La Nada, El Niño, or Three-Peat La Niña for 2012/13 ENSO Season? | Watts Up With That? Bob,I will do a review when I have finished reading the kindle edition. I do note the one only review on Amazon, it does not sound like the reviewer has read it. Hopefully more readers will post reviews for you. Keep up the great work Bob, we do appreciate your efforts Have you seen the reviews on M Mann’s book, there is a lot, lots of spiting too. I did a review on it called tic tac toe? Pingback: Gavin Schmidt issues corrections to the RealClimate Presentation of Modeled Global Ocean Heat Content | Watts Up With That? Pingback: More data fiddling – this time in NOAA’s ENSO data | Watts Up With That? Pingback: Tisdale: NOAA Issues El Niño Watch for Second Half of 2012, Joe Romm Issues “Rapid Warming” Alert for 2013 | Watts Up With That? Pingback: Sea Surface Temperature Approaching the Threshold of El Niño | Watts Up With That? Pingback: Cooling that East Coast sea level hotspot | Watts Up With That? Pingback: Part 2 of “On Sallenger et al (2012) – Hotspot of Accelerated Sea Level Rise on the Atlantic Coast of North America” | Watts Up With That?